Dienekes’ Anthropology Blog mentions this week several papers that dwell in the nature of the Nordic Bronze Age, specifically in Southern Sweden. It turns out that the copper used by the Nordic smiths was not local in almost all cases but imported from elsewhere in Europe (Sardinia, Iberia, Auvergne, Tyrol and British Islands) or even West Asia (Cyprus). This imported copper was exchanged by essentially amber, it seems, an export product of the Nordic area since the Chalcolithic. Nothing is said about the tin needed to make bronze but most likely it came from SW Britain and/or NW Iberia, as these were the two main producers of the strategic metal in old times. The Bronze Age of Scandinavia (1750-500 BC) is characterized by the sudden appearance of bronze objects in Scandinavia, the sudden mass appearance of amber in Mycenaean graves, and the beginning of bedrock carvings of huge ships. We take this to indicate that people from the east Mediterranean arrived to Sweden on big ships over the Atlantic, carrying bronze objects from the south, which they traded for amber occurring in SE Sweden in the Ravlunda-Vitemölla–Kivik area. Those visitors left strong cultural imprints as recorded by pictures and objects found in SE Sweden. This seems to indicate that the visits had grown to the establishment of a trading centre. The Bronze Age of Österlen (the SE part of Sweden) is also characterized by a strong Sun cult recorded by stone monuments built to record the annual motions of the Sun, and rock carvings that exhibit strict alignments to the annual motions of the Sun. Ales Stones, dated at about 800 BC, is a remarkable monument in the form of a 67 m long stone-ship. It records the four main solar turning points of the year, the 12 months of the year, each month covering 30 days, except for month 7 which had 35 days (making a full year of 365 days), and the time of the day at 16 points representing 1.5 hour. Ales Stones are built after the same basic geometry as Stonehenge in England. Ling’s paper is the one indicating that Swedish copper had exotic Atlantic and Mediterranean origins, while Gubanov’s highlights that amber from the Baltic is found in one Mycenaean grave (specifically Grave Circle B) and not in any known Minoan (Eteocretan) one. For him this means that bronze metallurgy and other associated elements like the quadruple spiral motif arrived with Mycenaean sailors in the Bronze Age. Grave Circle B is actually older than the much more famous Grave Circle A (the pseudo “Agamenon’s Tomb”), although both belong to the Late Helladic I period (c. 1550-1500 BCE). This chronology is interesting because it was roughly in those dates when SE Iberian El Argar civilization began its phase B, characterized by Greek influence in burials (pithoi). It is worth mentioning here that while these are the first findings of amber from Nordic Europe in the Eastern Mediterranean, such jewels were common in Iberia since c. 3000 BCE (beginnings of Chalcolithic period). It would seem therefore clear that Iberia was a pivotal area in this purported Scandinavian-Greek exchange. The question is: did the early Greek sailors actually reached Scandinavia themselves or were they rather just receiving products by mediation of Iberian traders with a long tradition of Atlantic (and Mediterranean) navigation? It is probably a hard to answer question. But the studies point to some relevant cues, like the Swedish drawings of ships with rams and the presence of the (originally Mediterranean?) 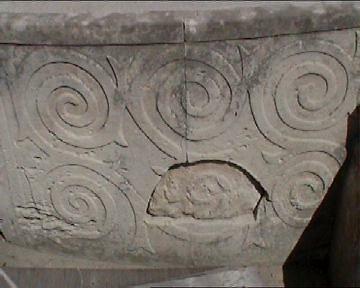 motif of the quadruple spiral, so similar to the Basque lauburu (four heads) icon (probably related to both the svastika and triskel). 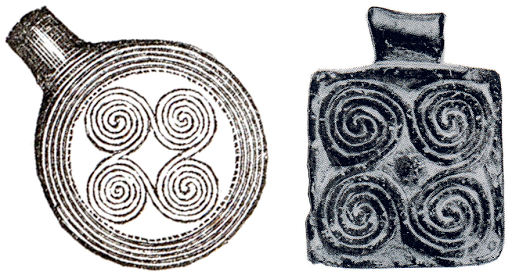 This spiral icon is not Mycenaean in origin, having been found in Minoan Crete and Megalithic Malta (right), which are respectively older and a lot older than the Mycenaeans. The motif is not even exclusive of Europe, with very similar concepts found for example in the pottery of Western Mexico. So while the similitude is striking, this evidence is not conclusive on its own. before the Mycenaeans in the East-West Mediterranean connections. So we are left with the claim of rammed ships being coincident with the Mycenaean period. However what I find searching around are dates of c. 1700 BCE (Norway), very early in the Mycenaean chronology and some two centuries older than the single amber finding in Mycenae. It could indeed be a Mycenaean influence but how conclusive is it? I have a vague memory of a Mycenaean ship (?) found years ago in the waters of Denmark or Germany, however I can’t find anything searching online. Does anyone know something more detailed on the matter? This would be key evidence but I cannot trust my memory alone. So there seems to be some sort of interaction between the Eastern Mediterranean and Scandinavia but, as far as I can tell, specifically Mycenaean presence in the Far North is circumstantial rather than conclusive. Not sure how new this is but it is a very interesting thing to know, right? Update (May 17): Dispatches from Turtle Island has some interesting and realistic calculations on how long would take an ancient ship to sail from Greece to Sweden and back (c. 112 days, he estimates). In brief: it suggests Iberian-like and Russian-like origins for two different Neolithic populations of Scandinavia. Pontus Skoglund et al., Origins and Genetic Legacy of Neolithic Farmers and Hunter-Gatherers in Europe. Science 2012. Pay per view. The farming way of life originated in the Near East some 11,000 years ago and had reached most of the European continent 5000 years later. However, the impact of the agricultural revolution on demography and patterns of genomic variation in Europe remains unknown. 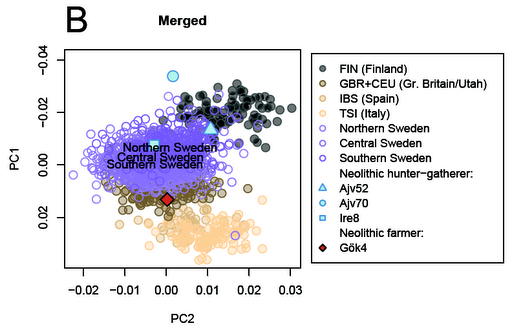 We obtained 249 million base pairs of genomic DNA from ~5000-year-old remains of three hunter-gatherers and one farmer excavated in Scandinavia and find that the farmer is genetically most similar to extant southern Europeans, contrasting sharply to the hunter-gatherers, whose distinct genetic signature is most similar to that of extant northern Europeans. 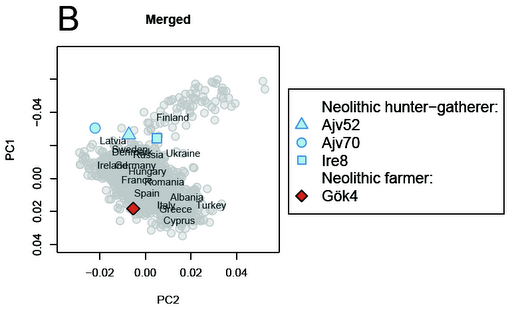 Our results suggest that migration from southern Europe catalyzed the spread of agriculture and that admixture in the wake of this expansion eventually shaped the genomic landscape of modern-day Europe. I don’t have access to the paper as such but the substance seems to be, as so often, in the supplementary materials, which are freely available (direct PDF link). The study analyzes the autosomal genetic signature of four prehistoric Swedes from the Neolithic period. Three are from Götland and belong to the regressive (neo-hunter, forest Neolithic) Neolithic culture of Pitted Ware, which has its roots probably in the Neolithic of Eastern Europe (Dniepr-Don culture). While they have been used as proxy for Paleolithic peoples, the comparison is not really valid: they were probably recent immigrants from Eastern Europe (or admixed with the Paleolithic locals maybe) with a Neolithic background although, because of the peculiarities of the Baltic frontier, they were not much into farming (it seems), although they did keep pigs. At the right, meet what is left from one of them, known as Ajvide 70. 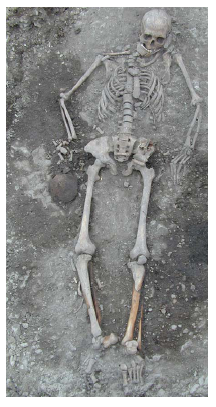 We can see some of the characteristic burial traits common in Pitted Ware culture but also in their apparent ancestors from Dniepr-Don culture (farmers): burial in extended position with ochre (visible at the legs in this case). The fourth one is from South-Western Sweden, near Göteborg and is consistently described as “farmer”. This individual belonged to the Megalithic cultural phenomenon (or more properly Dolmenic Megalithism, as there are some megalithic structures that may not be related or only tangentially so) that began in SW Iberia c. 5000 BCE and which is characterized by collective (clannic?) burial in dolmens, where the older burials were pulled aside to make room for the new ones. They also buried their people in extended position although the use of ochre is less common. Dolmenic Megalithism extended since the fourth millennium (at least a thousand years after it was conceived in SW Iberia) through much of Atlantic Europe, being these settlements of Southern Sweden in their further North-Eastern reach (together with Denmark and much of Low Germany). Later, after the loss of those areas to the Indoeuropeans of Kurgan cultural background (Corded Ware) the phenomenon would also expand into the West and even Central Mediterranean (North Africa, Italy)… but that’s another story. Both burial traditions stand in contrast with those of the Neolithic cultural arrivals from the Balcans (and possibly earlier from West Asia), the Balcano-Danubian tradition and the Cardium Pottery one of most European Mediterranean areas, which practiced burial in flexed or fetal position. So let me emphasize my point: both groups studied here are Neolithic but both belong to cultures which are not exactly what we could describe as “core Neolithic” but rather cultures that appear to have at least partial roots in Paleolithic Europe: one from the East and the other from the Southwest and later all the West. 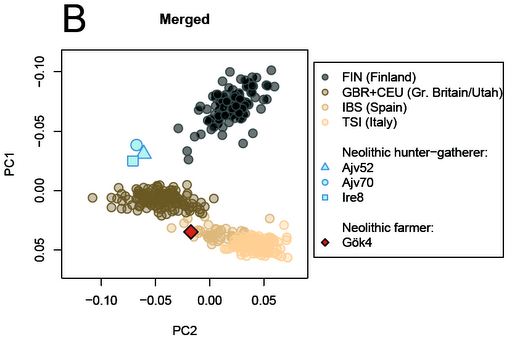 Interestingly the autosomal genetics of these two groups are consistent with what I just outlined: the Pitted Ware people resemble Eastern Europeans, while the Megalithic farmer clusters best with Iberians and other SW Europeans. We can see that the dominant component of the Megalithic farmer is orange, which is dominant in Sardinia but almost lacks the yellow component dominant in West Asians (and to lesser extent North Caucasus and Italy). The not compared Iberians could be a good match as we can see below. Two of the three Pitted Ware individuals cluster best with Russians, while the third does instead with some Finnish maybe. The main difference with modern populations in general is that the yellow (West Asian) component is residual, exactly as happens among modern Basques, Sardinians and Finns, which may have been rather isolated all this time. 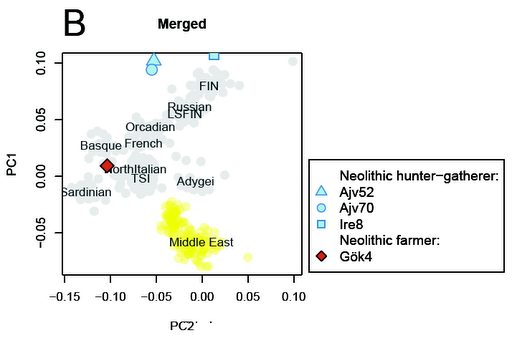 Judge yourselves because these comparisons are never 100% conclusive, but my impressions is that the Megalithic farmer (red) clusters mostly with Iberians, except in the last graph where it does with the British-CEU sample. The Pitted Ware samples (cyan or sky blue) are less precise (they are three after all) but where Eastern European samples other than Finnish are available for comparison, they tend to cluster with them (or between them and Sweden and Finland). 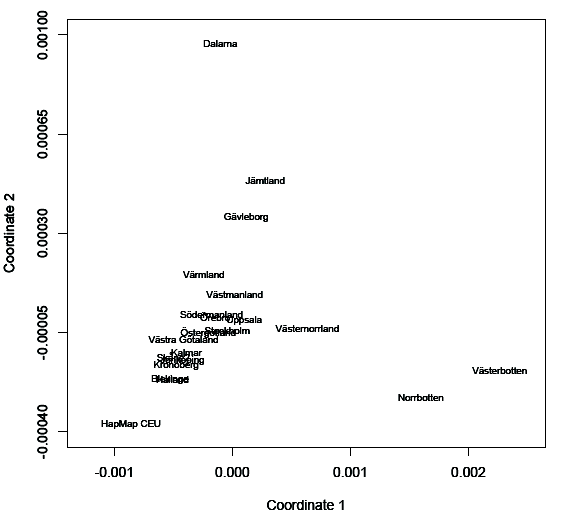 In the last panel, where Swedes have been oversampled and non-Finnic Eastern Europeans removed, Ire8 and Ajv52 cluster withing modern Northern Swedes, while Ajv70 is anomalous. So I do not think that the conclusions publicited in the press release (which are probably also those of the paper) can be taken at face value but rather with a good pinch of salt: the factual data seems to suggest that the genetics of these prehistoric people are quite related to that of modern Europeans from Scandinavia, Eastern and Western Europe. The comparison cannot be expected to produce identical individuals because, no matter how hard we might try or how much we may owe them in a sense, we are not our ancestors. K. Humphreys et al. The Genetic Structure of the Swedish Population. PLoS ONE, 2011. Open access. Swedes are not too heterogeneous so this exercise is a bit of applying a microscope. Yet I’d love to see much lower resolution analysis of comparable quality on many other populations of Europe or elsewhere. 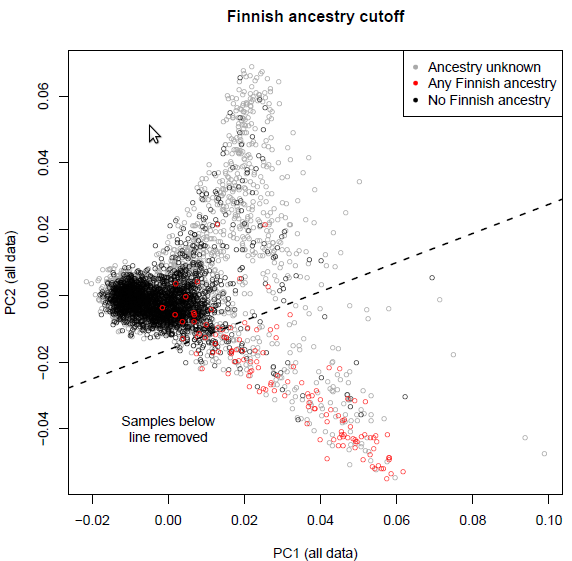 It may be argued that Finnish ancestry may be responsible for a large portion of the genetic stratification detectable in a Swedish sample but we chose to exclude them as the studies we combined had different inclusion criteria with respect to foreign ancestry. It is very apparent that the Norther Swedish lands, previously detected already as ‘different’ define PC1, while the isolated mountain county of Dalarna defines PC2. Both Finnish and Norwegian samples applied to these two PCs produced negative values (supp. materials), what reinforces this idea that they are a creation of genetic isolation in Sweden and not external influences. Further PCs (up to PC10) are mapped in fig S7 but I do not see them as very informative, excepting maybe PC6, which shows a pole near the Southern Norwegian border. See also in this blog: Swedish autosomal genetics. Elina Salmela et al., Swedish Population Substructure Revealed by Genome-Wide Single Nucleotide Polymorphism Data. PLoS ONE 2011. Open access. At K=2 we can see the nowadays already classical dichotomy between Finnish and other North-Central Europeans. At K=3 we get a third cluster (red) corresponding specifically to Swedes (or maybe Scandinavians in general) with some notable penetration in SW Finland but not in NE Finland. It’s also apparent in Russia (but vanishes at a later stage, so disregard), Germany and somewhat in Britain/CEU. As the second most important declared ancestry of Utahns, after English, is Danish, we notice somewhat more importance of the Scandinavian component among them. At K=4 we get the curious North Swedish distinctive cluster (green). The authors lament not having sampled Sami and Norwegians for comparison. However they do speculate to it representing a Sami element. This is in any case the most relevant discovery of this paper. At K=5 we get a distinct East European component dominant among Russians and with important penetration in Germany, probably the result of Indoeuropean (and then also Slavic) migrations in the past. Six zones of strong genetic change inferred by the Barrier software. 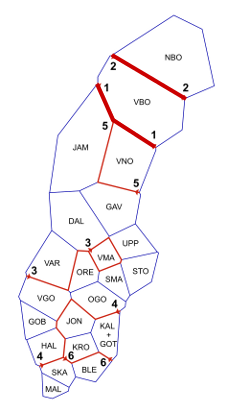 The borders (in red) are numbered in decreasing order of strength, and they are based on FST distances that have been corrected for the geographical distance between provinces. Note that the FST values differ significantly from zero only for the first two borders. That is why I emphasized with thicker lines the only two genetic barriers, which are statistically meaningful (1 and 2).